ABSTRACT: Living coccolithophores and coccoliths from surface sediments were investigated in the western equatorial Indian Ocean off Tanzania, from the coast and Pemba Channel to the open ocean. In total, 49 plankton samples from 8 stations and 20 surface sediment samples collected in February 2008 were analysed. 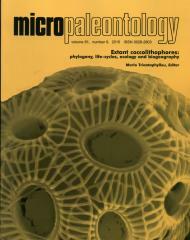 Coccolithophore standing stock ranged from barren up to almost 23,000 coccospheres/l in the upper water column and the living community comprised 47 different taxa in total. In addition, six more species were only found as detached coccoliths. Coccolithophore numbers were generally low and only Florisphaera profunda, Gephyrocapsa oceanica, and Emiliania huxleyi were numerically important (>5,000 coccospheres/l). Two distinct depth-related assemblages were identified. The upper photic zone (down to about 50m) in the Pemba Channel was dominated by G. oceanica and can be related to slightly increased nutrient conditions. In contrast, the upper photic zone community in the open ocean (down to about 70m) is characterised by high numbers of Umbellosphaera irregularis, typically indicating oligotrophic stratified waters, high sea-surface temperatures and strong water stratification. The lower photic-zone flora in the whole study area is generally dominated by F. profunda and accompanying species. A total of 40 species were identified in the surface sediments and total coccolith numbers vary drastically from <1000 to 18,200 x 106 coccoliths/g of sediment. The absolute numbers are much lower near-shore and strikingly enhanced further offshore mainly due to heavy dilution by fine-grained terrigenous sediments. Nevertheless, the occurrence of species in the plankton communities compares well to those of the surface sediment assemblages although plankton samples are from just one season. This points to an excellent preservation potential in this area, which can be explained by high supply of clay-rich sediments and a therefore rapid burial of the coccoliths in shelf and upper slope sediments.